PhotoSmileys 1.0 Free Download - Turn face into photo smiley with fun iPhone app! Turn face into photo smiley with fun iPhone app! Turn face into photo smiley with fun iPhone app! Share your emotions in mail and texts. Replace boring stock smileys with fun, emotional photo smileys made out of your and your friend's faces. Do hundreds of things and have lots of fun with acting characters! With eight characters, nine emotions and unlimited pictures to process you can create hundreds of smileys without any two that look alike. Using PhotoSmileys could not be made easier. A few taps on the screen of your iPhone is all you need to produce smileys that are full of character. 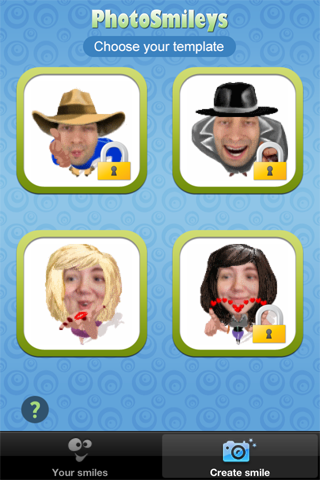 Launch PhotoSmileys, select your character and pick a picture that has your face anywhere in it, and PhotoSmileys will do the rest automatically. There are 8 unique characters that are full of fun, showing a mini-performance to express one of the 9 emotions. They're acting like cartoon characters - you just have to see it! Cowboy and gangster, blonde and brunette will behave differently to express emotions. A shy gangster? A kissing blonde? Try them all out - it's lots of fun! If you like what you see, you can unlock a character for only 99 cents. After unlocking a character, you can process an unlimited number of pictures. Use emoticons created with PhotoSmileys in mail and text messages to convey your emotions with no limits. Statement: First, please download the orginal installation package by clicking the download link. Of course you may also download it from the publisher's website. Using PhotoSmileys crack, key, patch, serial number, registration code, keygen is illegal. The download file hosted at publisher website. We do not provide any download link points to Rapidshare, Hotfile, Depositfiles, Mediafire, Filefactory, etc. or obtained from file sharing programs such as Limewire, Kazaa, Imesh, Ares, BearShare, BitTorrent, WinMX etc. Software piracy is theft. If you like PhotoSmileys please buy it.